As Japan’s population shrinks, the Japan Self-Defense Force (JSDF) is turning to a new demographic to make a difference in their ranks: women. This bold act is pushing the boundaries of gender stereotypes in Japan’s traditional society. In conservative Japan, women assumed the roles of maintaining the household or worked in administrative and office work capacities. But all that is changing as Japan’s women are breaking rank, stepping up to the plate and joining the world’s eight most-powerful military of 2018 – the Japan Self-Defense Forces (JSDF). The JSDF, which was formed after World War II for the purpose of defending Japanese territory, has been more visible in recent years, since tensions have been heightening with China and North Korea. Though the JSDF has been expanding its fleets with new units, aircraft and ships to combat those rising tensions, it has not been able to overlook a critical hurdle – low recruitment rates due to the country’s dwindling population, which has the oldest age average in the world. It is now up to the women of Japan to fill in the ranks, and today, they are more than meeting the challenge, with many women in different positions on the front lines. Women’s involvement in the military started at the beginning, when the JSDF was formed in 1954. They were first recruited to work solely as nurses, but in 1977, all that changed when the navy welcomed its first female recruits. By the time the early 1990s came around, women were serving in almost all military roles, except those requiring direct combat. Today, women have gone all the way. Just last year, submarine crews, which were previously all-male crews, announced that their doors were now open to women personnel. This will take effect after separate dressing rooms for women are built onboard, but there is currently no set timeframe for the implementation of the change. CNN has been working with the Pulitzer Center on Crisis Reporting, gaining never-before access to a female navy boot camp and personal interview time with women working on the front lines of defence. All quotes, figures and media are gathered with permission from the original CNN article, which can be viewed here. Former actress Isomura is training hard to reach her goal – to work on a submarine. Now that submarine crews will be open to woman, as declared just last year, Isomura has every chance to achieve it. She joined the Japanese navy, her determination fuelled by a 2018 trip to Bosnia and Herzegovina, where she was moved by seeing the damage from the war of 1992-1995, where more than 100,000 were killed. Former airport security guard Akiko Hiyarama joined the JSDF after seeing how hard they worked during relief operations on her own hometown in Okayama prefecture in western Japan, which had been ravaged by strong floods. 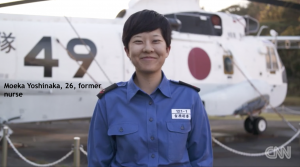 Inspired by the JSDF’s unflagging dedication, she joined the ranks of the Japan Maritime Self-Defense Forces (JMSDF). “Japan has so many natural disasters, and our home was actually flooded in July. My dad went to help as a volunteer, it was so terrible. He told me how tirelessly the JSDF had worked to save people, I was really moved and made up my mind to join the SDF,” Hirayama relayed. Former nurse Moeka Yoshinaka joined the forces, motivated by a desire to protect her country and out of a sense of adventure, with a goal to get assigned aboard a ship on the Atlantic ocean called the Shirase (icebreaker). “My friends and family warned me that protecting the nation would be tough. They asked if I was afraid of it, but I asked myself: ‘Who will do the job if everyone is afraid?’ … Who’ll protect Japan if we don’t?” said Yoshinaka. Today, 6.1% of Japan’s non-conscription military is made up of women, which is low compared to 12.2% in the UK and 16% in the US. Japan aims to grow that number to 9% by 2030, but its biggest threat is not overseas in North Korea or China – it is at home, where the decreasing population, currently at 124 million, is in motion to fall to 88 million by 2065. 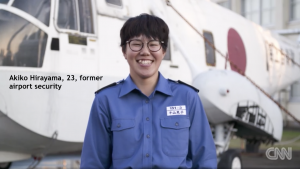 The JSDF has made some changes to its policies in order to boost recruitment and has increased the joining age to until 32 years of age from 27.